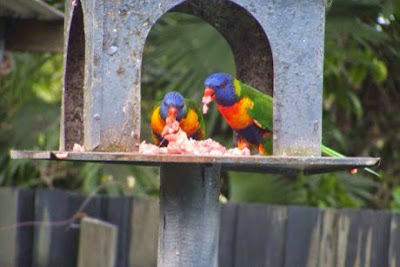 For reasons unknown, the rainbow lorikeets patronizing a backyard bird feeder north of Brisbane, Australia, have become carnivores. Instead of partaking in the seed meant for vegetarian birds including galahs, king parrots, and the lorikeets, they have been gorging themselves on the minced meat set out for magpies, currawongs, and kookaburras. Licensed wildlife carer Fran Sanders exclaims, "I'm absolutely amazed and horrified."